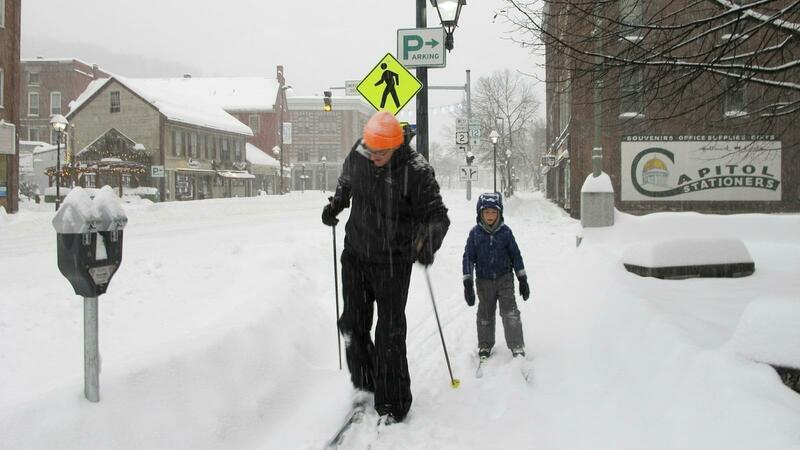 Nicholas Nicolet and his son Rocco cross-country ski on Sunday in Montpelier, Vt. A major winter storm hit the Midwest and New England this weekend. A major winter storm is disrupting transportation routes in parts of New England and the Midwest, after bringing snow and freezing rain to the areas. The National Weather Service has issued winter storm warnings or advisories for parts or all of at least eight states, and states of emergencies were declared in Pennsylvania and New Jersey. Amtrak has canceled some trains along the northeast corridor, and more than 9,000 flights were delayed or canceled on Sunday according to FlightAware.com. Rich Otto, a meteorologist with the Weather Prediction Center, told NPR, "The storm is currently located near the New Jersey and Long Island coasts, and it's going to track to the northeast across Cape Cod, and just off shore of Maine tonight, into early Monday morning." 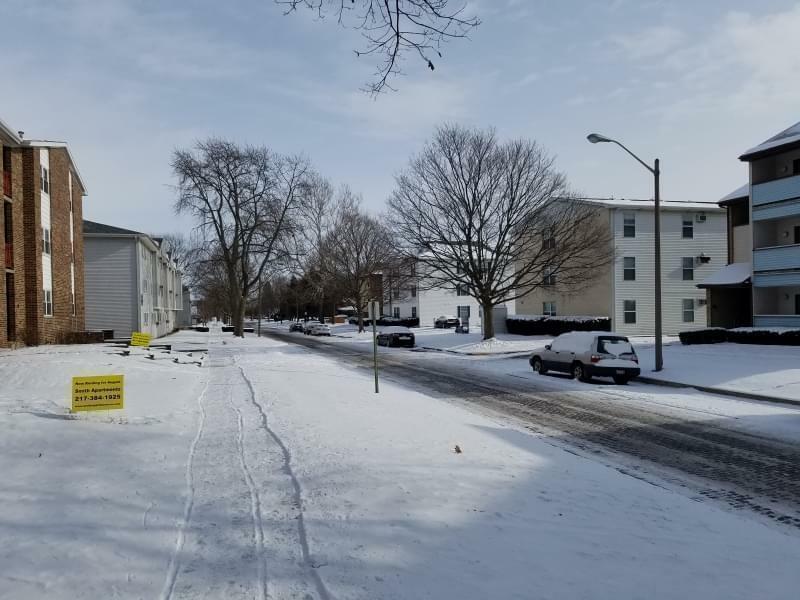 "We've seen reports of over a quarter to a half inch plus of freezing rain accretion, which I imagine is going to have a detrimental effect on power lines and tree limbs," Otto continued. "You combine the ice and snow, with what is expected to come later this evening and tonight, which is a strong push of cold air, and strong winds, with gusts anywhere from 20 to 40 miles an hour, locally higher, along the coast, and that's going to likely generate a lot of power outages, beyond what already might be occurring across New England." 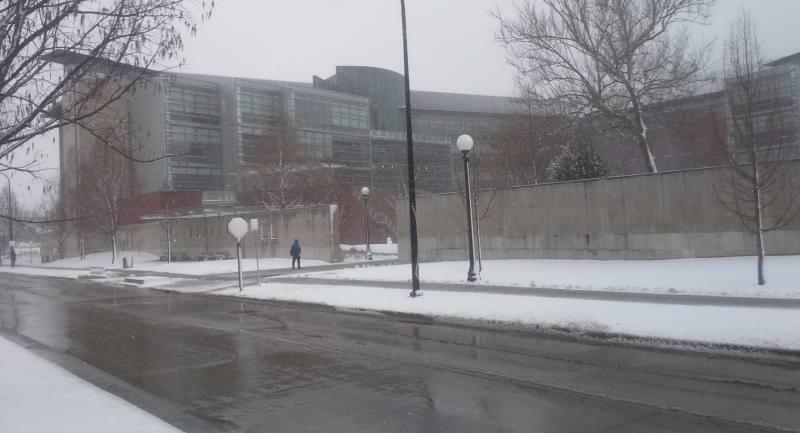 Meteorologists say the storm was created by a clash of an Arctic high pressure system with a low pressure system in the Ohio Valley. As ice accumulated on trees and power lines, Connecticut utilities reported more than 14,000 customers are without power. The storm brought up to 11 inches of snow to parts of upstate New York overnight. In New York City, snow was followed by rain, which is expected to turn into ice later on Sunday, while some areas in New England could see up to 2 feet of snow. 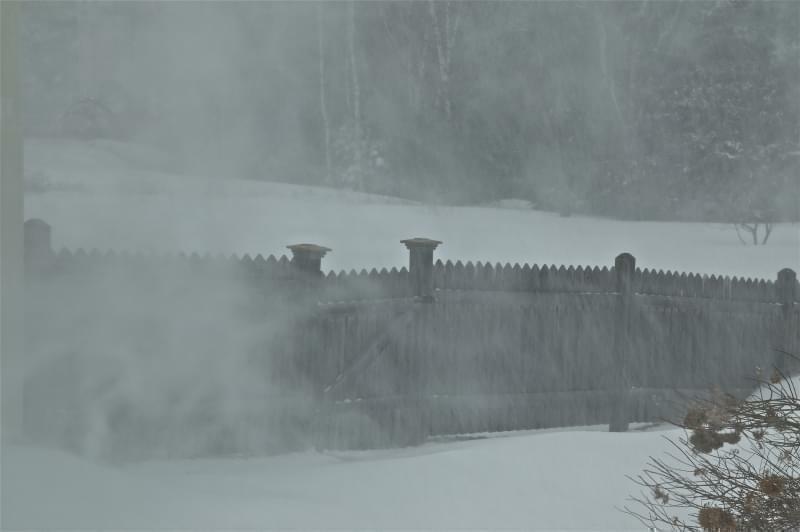 The storm will leave frigid air in its wake, with arctic wind chill temperatures as low as 35 below zero expected in Vermont, Maine and New Hampshire. The Massachusetts Emergency Management Agency has warned temperatures could fall as low as 30 below zero in the Berkshires this evening. On Saturday the storm dumped 10 inches of snow on parts of the Midwest, left more than 13,000 power outages in the state of Ohio, and created havoc for many travelers throughout the region. In Kansas, a snowplow driver was killed when the plow drove onto the shoulder of a road, turned over and rolled on top of him. Slick roads led to a 15-vehicle pileup in Missouri, and a United Airlines plane skidded off the runway at Chicago's O'Hare International Airport on Saturday morning. Otto told NPR he expects cold winter weather to continue to envelop much of the eastern U.S. for the next few weeks. "Looking at the Climate Prediction Center's outlook over the next one to two weeks, it's favoring high confidence for well below average temperatures over the eastern half of the nation," he said.